I really don’t know a lot of Helen (Ellen Bowser) White’s early years as many who would know it have also passed away. I did know her maiden name although I did learn much later that her first name wasn’t Helen after all. It was actually Ellen. No one in my family seemed to know how or when it got changed. It was just accepted by everyone. I never knew exactly how old she was when she got Polio only that she had it and had been left with limited use of her legs. Needing a cane to walk any distance this didn’t stop her from finding a loving husband, doing ALL her "wifely" chores, spending hours standing to cook & can for the coming winter and travelling by car across Canada to visit relatrives every few years. Nor did it stop her from going to the hunting camp on a yearly basis with her husband no matter the weather. 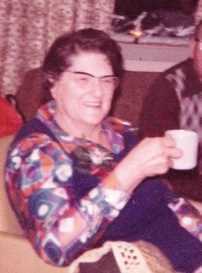 Because of her many visits with us throughout the years she quickly became our favorite Great Aunt. (Okay…she was pretty much the only relative from either my mother or father’s side of the family who visited us often. However she was always bringing us homemade goodies and interested in what we had to say even though we were just little kids). I idealized her as a child then even more as a young adult when she was hospitalized for TB. After a short time she had a full recovery and was back at home doing her duties once again. One of the things that attracted me to her was her faith… it never wavered. She was ever optimistic that she would either overcome her difficulties and if not …she would master living with them to minimize their effect on her life. She was a women of God and attended a few Oral Roberts Healing Sessions in hopes of giving up her cane. Even though she never fully gave it up…just attending these events gave her the courage to take steps without it whenever she could. She and her husband immediately took my Mom and us 3 kids in after my Dad died suddenly in a car accident… leaving my Mom in a state of shock and confusion. She had become a second mother to my mom after our grandmother died abruptly from a heart attack. Within 6 Months we were ready to move into a home of our own and distance was once more between us. She was to visit us many more times before she passed away.